Like it? Reserve it! Make this item yours before it lands into someone else’s shopping cart. The Luxury Closet allows you to buy your favorite item on Pay and Reserve, which means you can pay 25% of the value of the order (or more) and reserve it. Pay and Reserve is based on layaway method of payment and delivery. Our pay and reserve plan is simplified and gives you the opportunity to pay in one or more payment cycles within a 30 day period. The 30 day period starts from the date the order is received by our Customer Service team. Unlike in installment format, we ship the order only when you have made the full payment which must be completed within 30 days of reservation. Pay and reserve plan is cost/interest free, unless you have delayed your payment or cancelled it. Pay and Reserve is currently only available for items that are on sale for more than a month (30 days) and priced at USD 300 and above. Also, please note that the payment option under Pay and Reserve plan are Bank Transfer, Credit Card, Paypal and Cash on Delivery. However, Cash on Delivery option is only available for all orders in UAE with a charge of USD 8 to be paid once when COD is opted for. 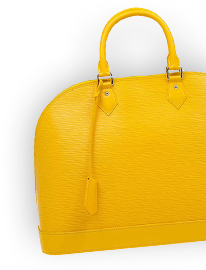 If you purchase a Louis Vuitton Monogram Canvas Hand Painted Speedy 30 Bag valued at USD 1071 and pay in USD. You can go ahead and reserve this item by paying 25% of the total value, which is USD 268, upfront and pay the balance amount of USD 803 later in one or more payments. There is no change in the USD value of the items and payments due. For example (refer to table below), whether you decide to pay on a Monday or on a Wednesday the payment amount remains the same and is not affected by the exchange rates. However, for EUR, GBP and INR there is a change as the currencies have fluctuating foreign exchange rates. In the table below the EUR valuation increases therefore changing the total amount of the item from EUR 1,008 EUR to EUR 1,001. The Luxury Closet sends reminder emails to buyers for payments that are due and delayed. If payment is incomplete after 30 days of reservation, an extension fee of 5% of the total value of the item will be charged at the beginning of each month of extension. After 60 days, if the payment is still incomplete we cancel the order and put it back on sale. We deduct the payments that are due along with the extension fees from the amount you have previously paid. A purchase can be cancelled any time, with a 25% cancellation charge. This means that you will receive a refund on your payment, minus 25% of the price of the item. Items that have been purchased on pay and reserve can be returned for a refund for up to three days after delivery, minus a 25% restocking fee.